The Acura section at the 2019 Canadian International Auto Show included models from the RDX A-SPEC, MDX, NSX, ILX, TLX TECH A-SPEC, and RLX. Now celebrating its 15th year, SH-AWD is the first all-wheel drive system that distributes the optimum amount of torque not only between the front and rear wheels but also between the left and right rear wheels. The result is uncanny cornering performance that provides incredibly neutral steering and outstanding vehicle stability. Most three-row crossover SUVs have one thing in common: poor handling. They’re big, ungainly beasts that lumber along the road like a bus headed to the football game. Then there’s the 2018 Acura MDX, a vehicle that should be in a class by itself. Unlike it’s brethren, the MDX grabs corners and dominates straightaways. It doesn’t stop with handling, as there is plenty to love about the MDX. Acura understands luxury automobiles, and they put everything they know into the MDX. With two display screens, 7 inch upper and 8 inch lower, you have access to Android Auto and Apple CarPlay at your fingertips. Upgraded you gain the 12 speaker sound system and a 16.2 inch ultrawide panel with split screen capabilities. Acura’s navigation suite with HD Digital Traffic will guide you around delays, while navigating with optional 3D viewing. It can’t always be fun and games, which is why the MDX includes safety features to help you feel secure. With AcuraWatch, adaptive cruise control and the Collision Mitigation Braking System keeps everyone on the road safe. Additionally, a surround view camera system and blind spot alert makes sure you know what’s coming from any direction. The real draw of the MDX is its power and performance. A nine-speed transmission controls the 3.9 liter V6, producing 290 horsepower and over 260 lb-feet of torque. Couple that with Acura’s Super Handling All Wheel Drive (SW-AWD), which transfers power to the necessary wheels during turning, and you’ve got a three-row vehicle that can take aggressive corners and hit zero to sixty in under six seconds. If you’re looking for an expansive SUV that can seat up to seven but drives like a sports car, let Acura of Barrie introduce you to the 2018 Acura MDX. It delivers the kind of performance that good things also come in big packages. Here at Acura of Barrie, we enjoy making sure that Acura’s compact sport sedans are always on your radar. The all-new 2018 Acura ILX naturally fits the mold, as it features bold, aggressively styled interior and exterior design, fantastic fuel economy, and a precision-happy powertrain. After careful consideration, we’ve come up with what we believe are the top three noteworthy features of the 2018 Acura ILX below. 2018’s Acura ILX has added yet another trim into its collection. The Special Edition trim features refined aerodynamic details that heighten the sporty look and feel of the car, as well as custom 18-inch alloy wheels with built-in resonators that add that much more fun and style to your driving experience. 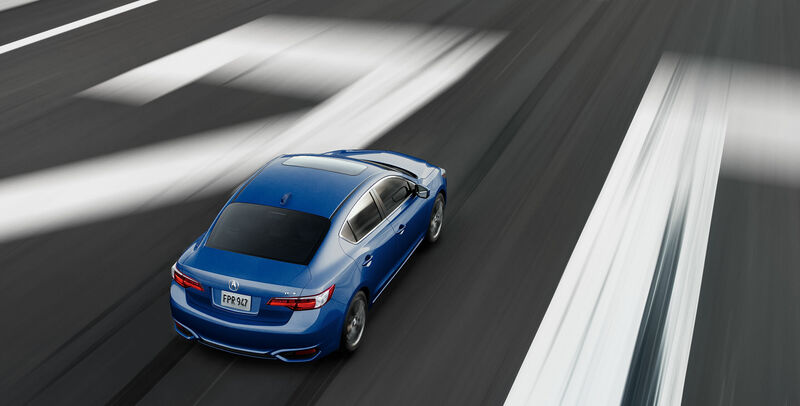 The new Acura ILX is a model to beat. Featuring a 2.4-liter DI four-cylinder engine, an 8-speed dual clutch transmission with 201 horsepower, 180 pound-foot torque, and drive-by-wire throttle control, the ILX is a worthy example of a car that doesn’t skimp on power. As long as you use the recommended premium fuel, your 2018 ILX should remain as powerful as the day you brought it. Thanks to leatherette-trimmed seating options that can be upgraded to either perforated Milano premium leather or Lux Suede® seating with contrast color stitching, the 2018 ILX gets off to a great start in the world of luxury auto interiors. The car also features 8-way powered driver’s seats, ensuring that your drive is always as comfortable as possible. Additionally, all trims feature seats with a two-level heating system, making the ILX ideal for those cold winter days on the road. Acura’s 2018 ILX contains an audio system comparable to that of high-end luxury car brands. While less expensive models feature the Acura six-speaker audio system, upgraded trims can enjoy the perks of a Premium Seven-Speaker Audio System that includes a subwoofer, or an ELS Studio®32 Premium Audio System with 10 speakers. When purchasing vehicles, people often choose cars that fit their ideals. Deciding to own a 2018 Acura TLX makes a clear statement that you love traveling in luxury and want to feel both pampered and excited every time you get behind the wheel. As soon as you sit inside the 2018 Acura TLX to prepare for a test drive, you’ll notice it’s an extraordinary vehicle made with a detail-oriented approach. Some of the car’s features aren’t immediately visible, but you’ll know they’re working during a journey. For example, each wheel has a sensor that monitors things such as the rotation speed and G forces, helping the car momentarily adjust as driving conditions change. There are also features that adjust the rear wheel angles to help you maintain stability when changing lanes or going around curves. Regardless of whether you’re driving across town or in the middle of an all-day trip to visit relatives, the 2018 Acura TLX makes driving hassle-free and fun for the driver and passengers alike. At Acura of Barrie, we’re proud to help customers with every aspect of the car-buying process and more. Maybe you already own another Acura and want to bring it in for an annual service appointment. On the other hand, we can get you on a regular service schedule for a vehicle you buy from us, ensuring it runs as expected for as long as you own it. Depend on us for genuine Acura parts, too. If you need financing for the 2018 Acura TLX, talk to our on-site professionals about your needs. We look forward to using all our resources to make your vehicle purchase as affordable as possible while keeping your financial situation in mind. Plan to visit us soon and start enjoying our service-centric approach as soon as you arrive. If you’re in the market for a compact luxury SUV at a reasonable value, then the 2018 Acura RDX is just what you need. True to the Acura legacy, the 2018 RDX delivers on its high expectations. Here’s what we at Acura Of Barrie think you should expect from the RDX. The interior quality of the RDX is just about what you would want from a luxury SUV. You can expect a quiet, smooth ride and comfortable seating for 5 adults. Leather seats come standard and you can add leather upholstery and ventilated front seats in the Advance Package. The RDX provides more than enough cargo space. With the back seats up, you’ll have access to 26.1 cubic feet, and with the seats folded, you get 61.3, which is one of the best in this class. The RDX provides a quiet ride with smooth acceleration and braking performance on par with other in its class. Steering is precise and adequately responsive. The level of comfort included in the RDX makes it perfect for your everyday drive as well as weekend activities. The seats provide ample room and the cabin is very quiet. It uses Active Noise Control to cancel out unwanted sound frequencies. Among its included standard features are 18-inch wheels, cruise control, rearview camera, sunroof, Bluetooth phone and audio. There are no trims to the RDX, but it does come in three different options packages – Technology, which adds sports seats and navigation; AcuraWatch Plus, provides driver assist features; and Advance, which includes the features of the other two plus features such as remote start and ventilated seats. For your everyday drive, you can’t go wrong with the 2018 Acura RDX as it sits perfectly at the intersection of value and luxury. Feel free to contact us should you have any additional questions. We’re here to help you find the car of your dreams. If you are in the market for a new car and are thinking about purchasing a luxury vehicle, you should consider an Acura TLX. The 2018 Acura TLX has several key aspects about it that might make it a solid choice for you. Here are several advantages to buying the latest Acura TLX model. One of the first things you notice about any car, sedan or SUV is the exterior. The Acura TLX offers you a noticeably sleek appearance that is sure to turn your friends’ heads when you drive up in your brand new sedan. It is the just the right combination of a sporty and luxury vehicle. If you decide to go with the 3.5 L v6 engine, it offers you the capability to get up to 96.6 km/h in less than 6 seconds. The handling and performance of the 2018 Acura TLX is hard to match. Not to mention, the Acura TLX has a history of success. In 2015, the Acura TLX was awarded for being the luxury midsize car of that year. So, if you are looking for a luxury midsize car, the Acura TLX may be what you need. Another advantage to buying the Acura TLX is the spacious interior you will be able to enjoy. You can have up to 4 passengers ride comfortably inside your luxurious sedan. The sedan offers a bit more room than the average car. You may want to consider purchasing this sedan if you want to be able to accommodate more people. A roomy interior, luxurious outward appearance and a proven performance are just several advantages of purchasing an Acura TLX. As you know, buying a car is a big investment, which is why it is important to not make any rash decisions. If you are interested in owning a 2018 Acura TLX visit the Acura of Barrie, Ontario, Canada.